BMWs are fantastic machines to drive. Nevertheless, they are becoming bigger, heavier and more complicated by each generation that goes by. Those who have been around bimmers since, at least, the nineties must agree with me when I say that something was lost. What was once a raw and engaging M car has been replaced by a bunch of wires and a heavy “arse”. 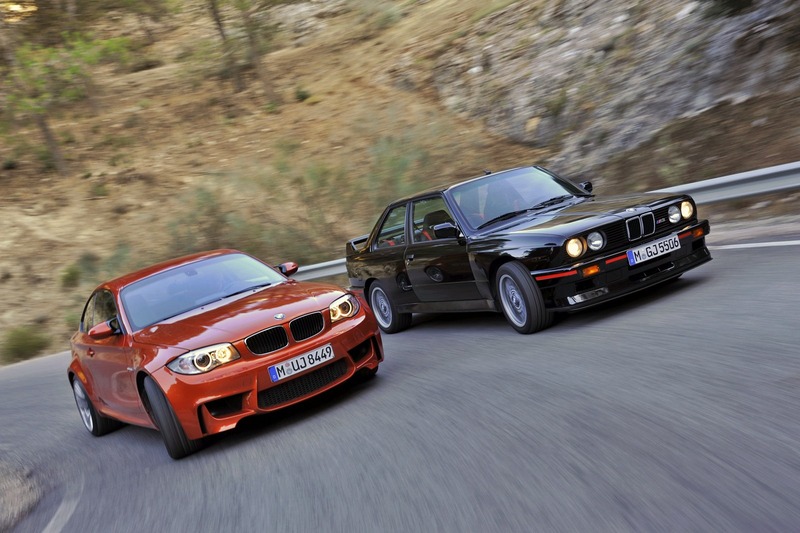 When you take, for instance, into perspective a BMW M5 F10 and compare it to an E34 generation… or even an E39 it is easy to see where I am heading with this argument. 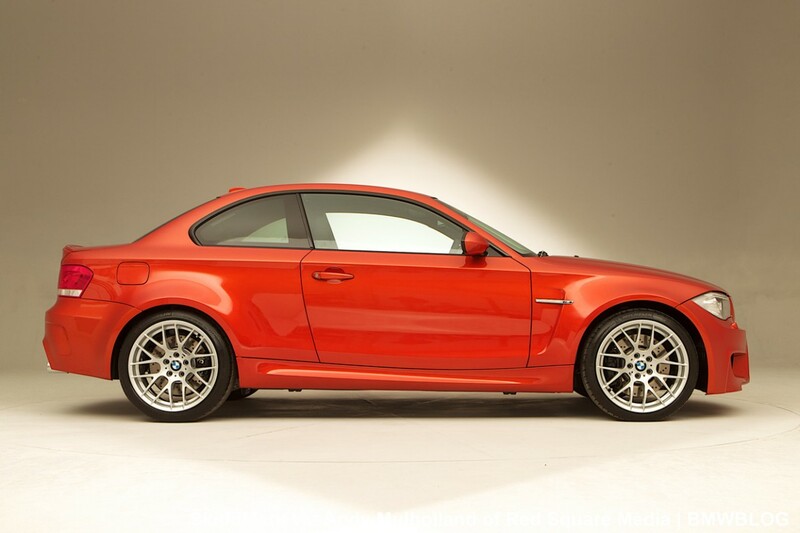 To prove they can still pull it off, 2011 was the year BMW brought us a sibling from the past (at least in philosophy) – the BMW 1M Coupe. 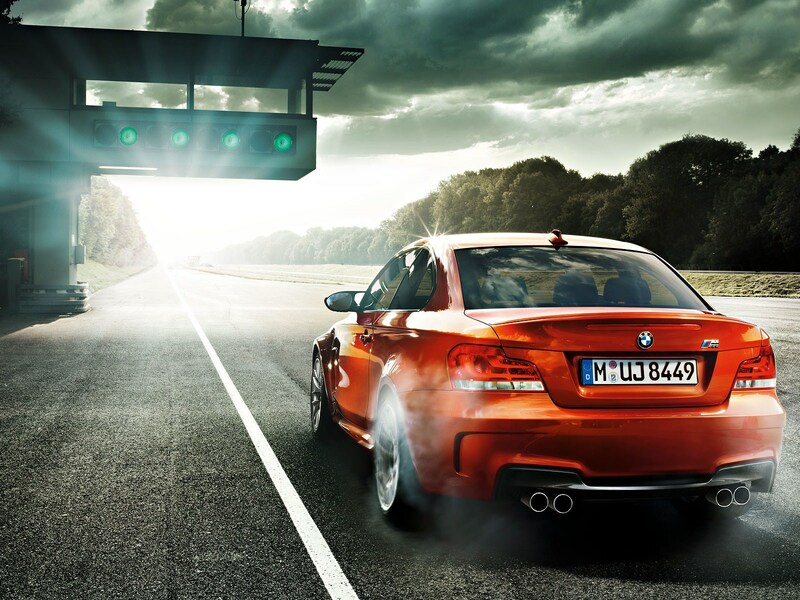 A smaller M car focused on driving dynamics totally. A worship to the original M3 E30: small, sharp, direct and aggressive. Instead of going for the natural aspiration, BMW went with forced induction, using an already known recipe in terms of engine. More on that below. What was meant to be limited series, with 2700 cars produced, ended up resulting in a total of 6039 cars sold worldwide by mid 2012. It was a huge success. On of the most brilliant modern ideas from the M division in recent time. 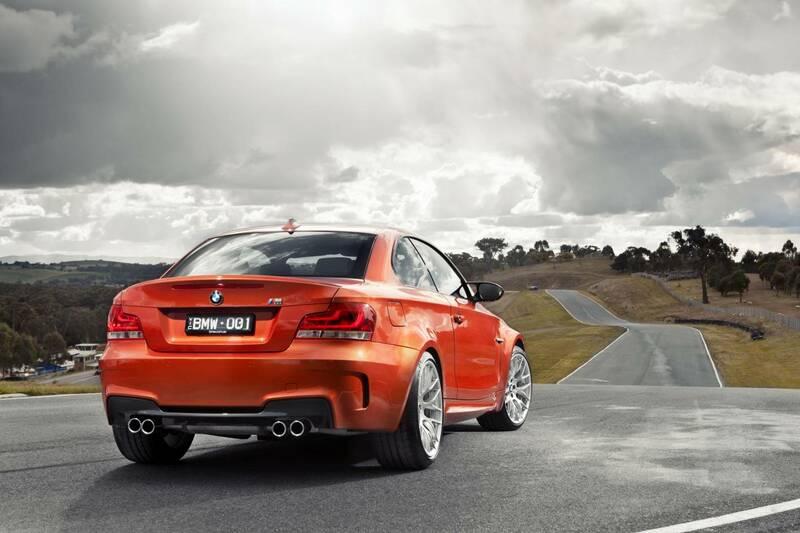 The car is based on the E87 chassis of the old 1 series coupe, known for the famous 135i. Without much innovation, the 1M is a congregate of several bits and pieces of other BMW cars in a compact package. Gearbox? With some adjustments and differences, but based on the M3 E92 (believe me, they are not the same. I have seen both boxes, and there are significant visual differences which implies that the M3’s can handle more load). Suspension? Also based on the bigger brother M3. Brakes? Again, they come from the M3. Engine?! Hold on a little. Altough the 1M uses a bunch of goodies from the M3, BMW decide to go a different route with the power plant. During 2007, BMW brought back turbos in its regular production vehicles – This is the year the BMW 335i debuted, replacing the 330i. At the time, numbers claimed by BMW were relatively conservative, stating outputs of 306 Hp and some 400 NM, as from 1400 rpm and flat until 5000 rpm. Everyone knows that this N54 engine even in oem disguise produced a little more than that. In 2010, the N54 twin turbo was replaced by the N55 single turbo twin scroll (variable geometry turbo), with identical horspower and torque figures (at least on paper). The S54 had clearly shown more potential in the tuning department, but it could not hide the fact that it required a lot of attention to be reliable. Even without modifications, problems with fuel injectors, high fuel pressure pump and water pump were common. Nevertheless, BMW did not give up on the engine, but rather it reserved for more special models, the first being the Z4 35i. The second choice of application was the 1M. 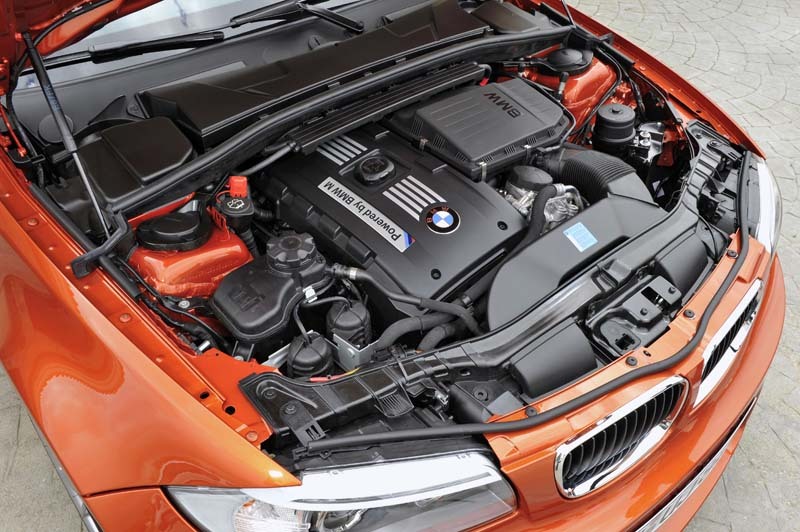 After M division’ special treatment, the N54 produces 340 Hp at 5900 rpm and 450 NM of torque as soon as 1500 rpm. These numbers remain flat until 4500 rpm. You also get an over boost function that will momentarily raise your torque figure to about 490 NM each time you press the accelerator to the bottom. The 1M only came with a manual 6-speed gearbox. It is rear wheel drive. Kerb weight is a pubic hair beneath 3450 pounds. Simplicity and being light on its feet suggests something special. I have heard people saying the 1M is a 135i on steroids. This is an understatement. In fact, there is debate of which is faster: the 135i with the N55 engine and the M-DCT gearbox (double clutch) or the 1M. I would rather not go into detail on this, because comparing these two cars on such grounds would not do justice to the greatness beneath the 1M. In my opinion, if you are in doubt of acquiring an 1M as a fun toy from the brand, you alternative should be a manual BMW M3 (E92). As soon as you step in the car, everything is quite simple. Aside from the iDrive, there is not much else to distract you. 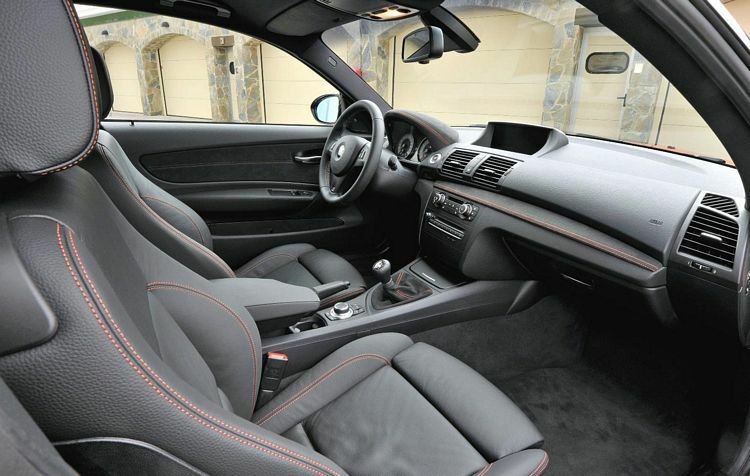 You get alcantara application throughout the interior of the car. 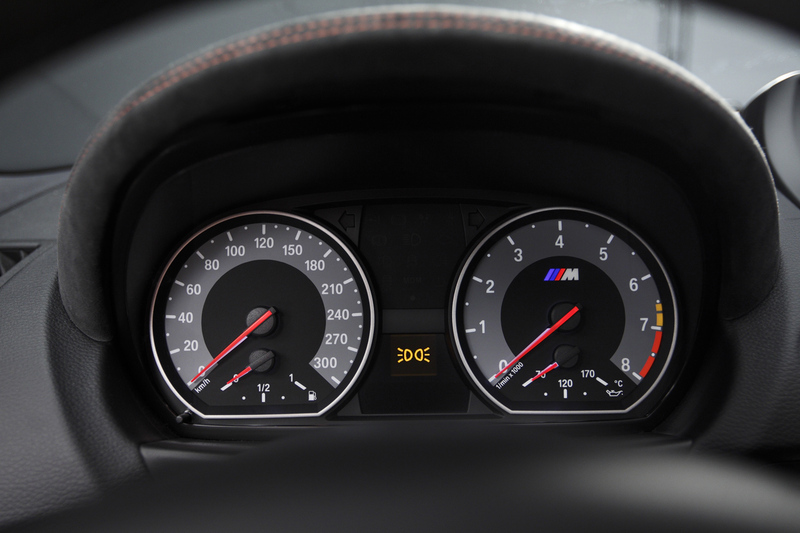 An M button is right there on the steering wheel that will only give you sharper throttle responses. There is not a bunch of driving modes for you to pick. If it wasn’t for the iDrive, you could trick yourself into thinking you bought a 90’s car. Interior wise, the cabin is not as refined as the one you find in an M3. The 1M looks and feels cheaper than the bigger brother on this department. One should not forget, nonetheless, that the 1M was built to be an ultimate driver’s car. There is no place for distractions. Will it cut it? This question comes up because although a driver cannot see with his eyes, there is a bunch of electronics there. Nowadays, automotive industry has no place for purely unassisted raw cars. As previously mentioned, BMW was claimed that this car was made to honor the original M4 E30 – light on its feet, agile, small and precise. At the time of its debut, the E30 used a four cylinder engine (S14), which in its fastest version, provided a little over 220 Hp. Almost three decades later, this seems rather too little. As soon as you ignite the 1M, there is not much there to impress. No exhaust note to make its presence noticed. While maneuvering the car, the clutch is really light and bites really easy. Gearshifts smooth and simple (easier than in the M3 E92). It is so practical I refuse to believe what it can do, but, again, even the original M3 E30 was quite user friendly also. Things would change a lot as soon as pressed the accelerator hard. BMW states that peak torque comes at only 1500 rpm, but the notorious turbo lag ends noticeably by 3000 rpm when traction control light comes up to warn me about the lack of grip. It is a funny feeling to be overwhelmed by so much torque on the low end of the rev band in a M division car. The turbos kick in and speed grows with a sense of silent killer that is unprecedented in my experience. It is definitely a colder experience that what you had in the naturally aspirated M engines. After swallowing the first three gears, I really did not felt I was going as fast as I was. You can feel electronics working to make the car less aggressive and road friendly. Electronic nannies have such a greater presence than in the M3s that preceded it. As soon as it notices irregular asphalt or wheels spinning, it cuts all the fun away. Each gear shift, the tail end shook a little bit. That chassis refinement you find in an M3 is not present here. Speed increases in a subtle manner without much of a warning. You simply hear the 6 cylinders sound in more baffled way due to the turbos working. After a couple of stretches, I noticed that shifting a little below 6000 rpm (around 5700 or 5800 rpm) made the turbos sustain more punch. At this point, I was already impressed by how aggressive the 1M felt on a straight line. I still wanted to see this baby turn. Well, the 1M certainly behaves a little more on the edge than the M3 E92. Not only because of the turbocharged engine in the smaller sibling, but also because of its shorter wheel base. In order to find that delicate balance that you seen in an M3 mid-corner, you certainly have to be more gentle on the throttle input. Jump on it a little to soon and all balance fades out in much more impolite manner. As speed grows mid corner, you reach that limit so easy. The 1M becomes alive and really sensible, all of which transmitted by the steering wheel. In this sense, it reminds me much more of an E46 M3, but with more torque than the older sister. The have both really similar personalities when approaching the edge. Of course, the longer wheel base of the E46 compensates a lot for the aggressiveness of the 1M, but also made me think that this is perhaps a more natural successor in terms of personality for the E46 M3 than the E92 generation, which has more of a GT persona. Another situation where the 1M twitchy behavior was evident was when trying to make sudden direction changes. The 1M requires a lot of respect in this situation in order not to snap its tail. The short wheel base coupled with a bunch of low end torque will make you a lot easier on the throttle. The 1M forces you to be awake on all circumstances in order to drive it fast. Does this mean that it is an unbalanced and dangerous car to drive? Not at all. With all controls turned on, it will behave. Nevertheless, if you feel the urge to underestimate its aggressiveness, it has the potential to get you involved in a mess. This is not a car that anyone can jump on it and drive fast. It has a learning curve; one which requires practice and respect. Tame it and I can assure you that you will have become a better driver after the process and that rewarding feeling will be there to grace in end. It has all the technology modern cars must have in terms of safety, but it is far away from being a digital experience. Think of it as a modern rewrite of 80′ and 90′ sports car. It certainly have that old school feeling to it. Is the 1M a modern classic? Most definitely yes. It deserves a spot on the collectible world. It is brilliant, but it is not a car for everyone. Although placed bellow the M3 in the M division food chain, it is certainly a more challenging and engaging car to drive. 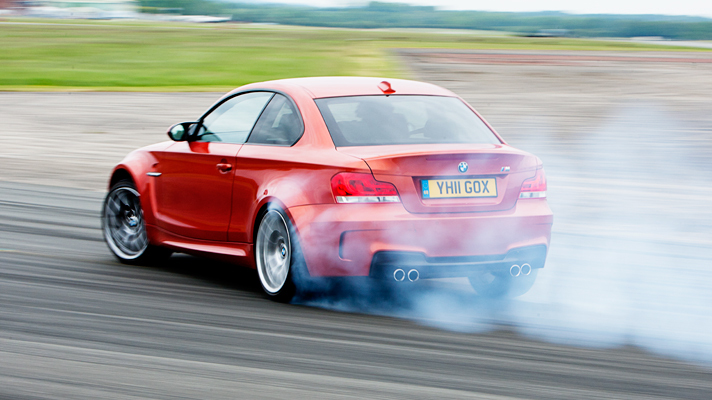 Between 3000 and 5800 rpm in the first three gears, it is definitely faster than a BMW M3 E92 with a manual gearbox. Aside from its performance, it is also a hand full to drivers. Making power slides with the 1M is certainly a more twitchy experience due to its turbocharged engine and short wheel base. It has less filters than one would expect from a modern car. It has a bit of temper. It shows how much a GT car the M3 has become, but driving the bigger sister, my feeling was of pure joy. On board of the 1M at all times I felt more focused and tense about the drive. Which is best? Different proposals. 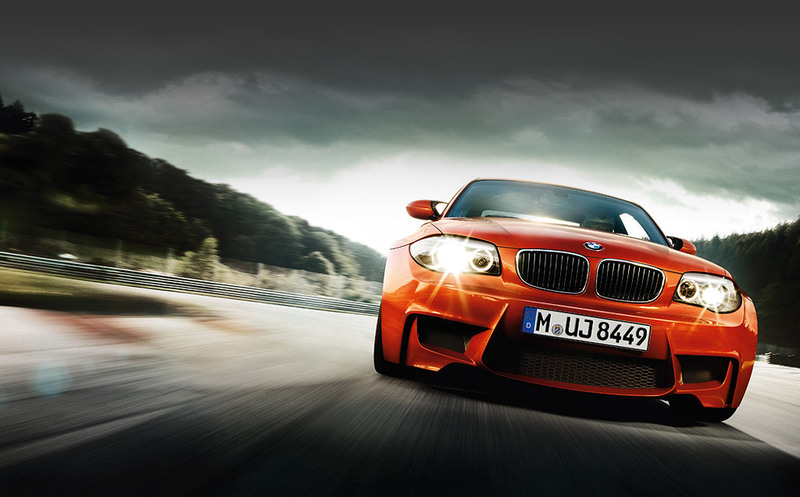 To me, the M3 E92 is more sorted out car. It delivers performance in a more refined manner and the V8 is a much more emotional experience. Would I own an 1M? Yes. As a good challenge, because I know it would take me a while before I tame it with all controls turned off. This is to show us that sometimes, numbers on a paper do not reflect character in real life. It takes guts to push this little beast. ← BMW 125i – UM EXCELENTE “CARRO DE PASSEIO”? !